Deontay Wilder retained the WBC heavyweight title with a ninth-round knockout of Artur Szpilka in New York. The unbeaten American knocked Szpilka unconscious with a right hand, with the Pole taken to hospital as a precaution. Britain's Tyson Fury, who holds the WBA and WBO belts, traded insults with Wilder in the ring after the fight. On the same bill, Charles Martin won the vacant IBF title when Vyacheslav Glazkov was forced to retire in round three with a serious knee injury. Fury was stripped of the IBF belt when he agreed a rematch with former champion Wladimir Klitschko, whom he beat in November, rather than fight mandatory challenger Glazkov. After the fight at Brooklyn's Barclays Center, Fury climbed into the ring, eyeballed Wilder and started singing "there's only one Tyson Fury" into a microphone, adding: "What have you got to say about that, Deontay?" Wilder, who has stopped 35 of his 36 opponents, replied: "You're just a phoney. This is just an act. You know where I am. You know what time, what place. I ain't scared of nobody. I'll come to your backyard, baby." Fury, who has won all of his 25 fights, made the same offer as the crowd booed, adding: "Any time, any place, anywhere. I'll beat you. You're a bum." A laughing Wilder then said: "I don't play this. You should have been an actor. You can run around like you're a preacher all you want, but you step in the ring, I promise you, I will baptise you." A unification fight between the pair could take place in Britain or the USA later this year. Southpaw Szpilka was "doing good" and "talking" after the fight, according to his trainer Ronnie Shields, who said: "He knows exactly where he is right now." 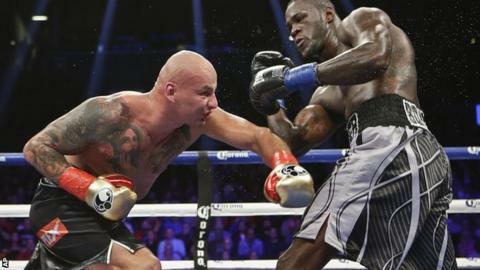 Wilder, 30, struggled for large portions of the fight but left Szpilka flat on his back with a powerful right hand with 36 seconds remaining in round nine. Szpilka, whose record is now 20-2, was out cold for several minutes as he was attended to by ringside doctors. Wilder is now due to make a mandatory defence against Russian Alexander Povetkin. "I'm surprised it took that long, but we had 12 rounds and they can't all can't be pretty," Wilder said. In the bill's other heavyweight title bout, Glazkov was a heavy favourite against American Martin, 29, but was forced to stop one minute 50 seconds into round three after twice falling to the canvas. The 31-year-old Ukrainian's right leg buckled as he threw a right hand and he tore an anterior cruciate ligament. The previously unbeaten Glazkov said: "I slipped and I felt a sharp pain in my knee and I felt it give out. I'm very upset. I want a rematch when I recover." Martin, a southpaw, said: "He just didn't have enough power. I was going to catch up with him eventually." Before the fight, Glazkov said he would be prepared to face unbeaten British and Commonwealth champion Anthony Joshua. The American's record is now 23 wins and one draw, while Glazkov's is 21-1-1.